1. Deepak Kumar, a Bihar Cadre IAS Officer of 1984 batch took over as the Chairman of National Highway Authority of India (NHAI) on June 28, 2017, successding Y.S Malik on this post. Mr. Deepak is a B.Tech in Civil Engineering from IIT, Delhi. Prior to his appointment as NHAI Chairman, he was director general Employees’State Insurance Corporation (ESIC) under the Labour and Employment Ministry. 2. India Joined a select group of countries having their own indigenous cryogenic engine technology when the Indian Space Research Organisation (ISRO) successfully launched its heaviest rocket, GSLV MK III – DI carrying India’s communication satellite-GSAT-19 on June 5, 2017 from the Satish Dhawan Space Centre in Sriharikota. The GSAT-19 weighing 3,136 kg was placed into a Geosynchronous Transfer Orbit (GTO) with a perigee 170 km and apogee 35,975 km. GSAT-19 will be India’s first satellite to provide internet service using the ka/ku band, faster than current satellites. The GSLV MK III-DI is a three stage / engine rocket. The core of the first stage is fired with solid fuel and its two motors by liquid fuel. Third is the cryogenic engine. 3. Haryana’s Manushi Chhillar emerged the winner of the coveted Miss India World Crown for 2017, beating 29 contestants across India in the pageant. Miss India jury comprising Bollywood stars Arjun Rampal, Illeana D’Cruz, Bipasha Basu, Abhishek Kapoor, Vidhyut Jammwal, eminent fashion designer Manish Malhotra and Miss World 2016 Stephanie Del Valle decalred Manushi Chhillar as the Miss India World-2017 at a splendid finale held at Yash Raj Studios in Mumbai on June 25, 2017. Sana Dua from Jammu & Kashmir and Priyanka Kumari from Bihar were declared the first and second runners-up respectively. It was the 54th edition of Miss India World pageant. 4. Sanjeev Singh became the chairman of the Indian Oil Corporation (IOC), India’s biggest oil company, succeeding B.Ashok on this post. Prior to his elevation, Mr Singh was Director on the IOC Board since July 2014. 5. India has been ranked on 45th position on the World Competitiveness List for 2017, compiled by International Institute of Managment Development’s World Competitiveness Centre. India suffered four spots loss this year in comparison of its last year ranking in the annual competitiveness ranking of the IMD. Hong Kong retained its top slot while Switzerland and Singapore were ranked second and third respectively on the list for 2017. 6. The Central Government on June 23, 2017 released a new list of 30 cities to be developed into ‘Smart Cities’, with Kerala capital Thiruvananthpuram topping the list. The latest list-including 12 state capitals-takes the number of cities chosen so far to 90 under the ‘Smart City Mission’. Chhattisgarh’s new capital naya Raipur secured second place on the new list. A total of 45 cities contested for 40 availble smart city slots, but only 30 were selected in the new list. The Central government launched the Smart City Mission on June 25, 2015 to develop 100 Smart Cities in five years. 7. The India Space Research Organisation (ISRO) successfully launched 31 satellites, two of them are indigenous, on board the PSLV-C38 launch vehicle from the Satish Dhawan Space Centre, Sriharikota on June 23, 2017. The PSLV in its 40th flight successfully placed the Cartosat-2 series satellite, the main playload of 712 kg and NIUSAT satellite of Noorul Islam University, Kanyakumari from India. The Cartosat-2 satellite will provide remote sensing service for five years like five similar satellites launched earlier. The other 29 nano satellites belonged to 14 nations – Austria, Belgium, Chile, Czech Republic, Finland, France, Germany, Italy, Japan, Latvia, Lithuania, Slovakia, the UK and the USA. The total payload weighed 955 kg at the lift off. 8. Shanghai Cooperation Organisation (SCO) Summit was held in Kazakhstan’s capital Astana on June 8-9. All the member countries plus those having observers’ status attended the meet. Capping a two year long process, India and Pakistan on June 9, 2017 became full members of the SCO, a China dominated security grouping that is increasingly seen as a counter weight to NATO. Before this the two countries held only observers status. India’s membership was strongly pushed by Russia while Pakistan’s entry into the grouping was backed by China. With the expansion of the grouping, the SCO will now represent over 40 per cent of humanity and nearly 20 per cent of the global GDP. 9. India on June 2, 2017 successfully test-fired its indigenous nuclear-capable Prithvi II missile from the Integrated Test Range (ITR) at Chandipore in Odisha. The surface-to-surface medium range ballistic missile was fired from a mobile launcher from launch complex 3 of ITR. The test was part of the regular training exercise by the Indian armed forces. The launch was carried out by the specially formed Strategic Force Command (SFC), which was monitored by scientists of the Defence Research and Development Organisation (DRDO), the source added. This missile, has a strike range of 350 km, is capable of carrying 500 kg to 1,000 kg of warheads and is thrusted by liquid propulsion twin engines. The missile was inducted into Indian armed forces in 2003. 10. India’s entry to the Nuclear Suppliers Group (NSG) stands stalled, thanks to the Chinese Government blocking the entry, though of course, most other members of the club are in favour of India joining the group. China on June 6, 2017 said it will stick to the two step approach for admitting Non-Nuclear Proliferation Treaty (NPT) countries like India into the Nuclear Suppliers Group declining to comment on New Delhi’s move to urge Russia to convince Beijing about its bid to join the bloc. 1. Defying the diplomatic pressure from Russia, Montenegro formally joined the NATO, the western military alliance as its 29th member at a ceremony in Washington on June 05, 2017. Montenegro’s entry into the NATO is a big diplomatic and strategic blow to Russia and this move further diminishes Russia’s influence in southeast Europe. 2. Pakistan emerged the winner of the 2017 ICC Champions Trophy, beating India by 180 runs in the summit clash at the Oval in England on June 18, 2017. Pakistan set a big 339 runs target before India to retain the coveted ICC crown, India batting line-up failed miserably under pressure and got all out on just 158 runs. Pakistani Opener Fakhar Zaman was adjudged the Man of the final for his fabulous 114-run innings while his teammate Hasan Ali was declared the Man of tournament. Pakistan defeated England in the semifinal while India trounced Bangladesh in semifinal en route to final. 3. US President Donald Trump announced on June 1, 2017 the exit of the USA from the historic ‘Paris Climate Agreement’ signed by 195 countries in 2015 to fight climate change. He termed the pact unfair to the USA, giving undue benefits to India and China at the cost of US economy and sovereignty. The US’ pull out from the Paris Climate deal will be a severe blow to global attempts to fight climate change: however the pact will continue to exist as more than 147 countries have ratified it till now. 4. Noted Indian economist Kaushik Basu became President of the International Economic Association (IEA) as his three-year term started on June 23, 2017. Basu’s top job at IEA started at the closing of 18th World Congress of IEA in Mexico. Mr. Basu has been the senior Vice-President and Chief economist at the World Bank from 2012 to 2016. He was the Chief economic advisor to the Government of India from 2009 to 2012. The IEA is an organisation for professional economist, seeking to shape global economic policy and research. 5. Iceland emerged the most peaceful country in the world on the 2017 Global Peace Index published by Sydney based The Institute of Economics and Peace. New Zealand and Portugal finished second and third in the most peaceful nations list carrying 161 countries in the list. Syria was the least peacful country for the fifth year in a row. The index uses 23 criteria to cover conflicts, domestic violence, crime, human rights, economic stability etc. to prepare the list. India has been ranked 137th position in the index. It is the eleventh edition of the Global Peace Index. 6. Fourth seed Rafael Nadal of Spain emerged champion of the french Open Men’s Singles Title – 2017 as he prevailed over Stan Wawrinka od Switzerland 6-2, 6-3, 6-1 in a one-sided final on June 11, 2017 in Paris. It was Nadal’s 10th French Open Singles Crown and 15th Grand Slam tournament in the open era. It was 53rd clay court title triumph of Nadal’s career. Winning this French Open title, Nadal became the first man to win 10 title at one Grand Slam tournament in the open era. It was 53rd clay court title triumph of Nadal’s career. He beat Dominic Thiem in the semifinal to get into the French Open summit clash this year. 7. Ananya Vinay, a 12-year old Indian-American student from Fresno, California clinched the 90th Scripps National Spelling Bee Championship on June 01, 2017 in Washington by correctly spelling Marocain and became 13th consecutive champion of the prestigious spelling competition of the USA from the Indian-American Community. Marocain means a type of dress fabric of ribbed crepe. She recevied a glittering trophy, $40,000 cash prize for being the Spelling Bee Champion. Rohan Rajeev, another 14-year old Indian-American student from Oklahoma finished runner-up in the contest. 8. A 47 year-old British man with terminal cancer is believed to have become the first cancer patient to climb Everest, the world highest mountain. Ian Toothill, the Sheffield Wednesday Football Club fan, who has been told he has just months to live, planted a flag of rivals Sheffield United at the summit for charity. The personal trainer, who reached the summit on June 5, 2017 has raised almost 31,500 pounds for the cancer charity Macmillan, beating the target of 29,100 pounds. 9. The British Parliamentary elections held on June 8, 2017 brought a shock for the Prime Minister Theresa May when the result showed her party losing majority and a hung house, throwing British politics into turmoil and uncertainty in forthcoming Brexit talks. May had called the snap elections to strengthen her hands in the EU divorce talks, but a resurgent Labour Party had sensationally denied her an outright win and May’s plans misfired. PM May’s consevative party won 318 seats, short by eight from the majority mark of 326 in the 650-member House of commons. A politically diminished, May entered into an ‘understanding’ with the Democratic Unionist Party (DUP), which won 10 seats, to remain in power. Labour Party increased its tally from 232 in 2015 to 261, building on a resurgence led by its leader, Jeremy Corbyn. 10. Veteran politician Sher Bahadur Deuba was on June 6, 2017 elected the new Prime Minister of Nepal. The Nepali Congress President garnered nearly two-thirds of the votes in Parliament to take the mantle from Puspa Kamal Dahal ‘Prachanda’. Deuba 70, takes the top post for the fourth time, 12 years after he was removed by the King Gyanendra Shah. He received 388 out of 593 votes while 170 votes were cast against him. His victory was almost a foregone conclusion as none of the other political parties had put forward their candidates. 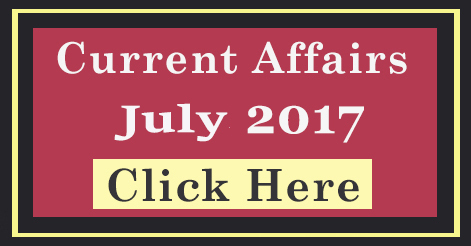 Help us to improve this article/job posting "Current Affairs : July 2017". We would be glad if you can comment below and provide your valuable suggestions and feedback. If this page have any wrong information/list or out of context content, then you can report us as well.